Huge thanks to Gonzo Moose for a wonderful performance of The Thing That Came From Over There on Wednesday night at the Wycombe Town Hall. 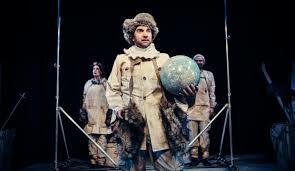 The show was a tightly-packed delight involving a glorious range of eccentric characters, arctic exploration, alien attack and lots and lots of joyful stupidity. It had us laughing heartily from start to finish. The cast stayed behind for a Q&A after the show, taking questions from Bucks Performing Arts students and other members of the audience. We learnt about the inspiration behind the many characters, the combination of devising, writing and rehearsing that goes into creating this type of show, and also how you set about rehearsing a scene that involves changing hats every three seconds. The company returns to High Wycombe in May 2017 to run a workshop for Bucks New University Performing Arts students. We were very pleased to be able to invite Jan Lee and Tim Murray-Browne to introduce our Performing Arts students to their latest work Movement Alphabet. Movement Alphabet is an artwork combining interactive technology with a one-to-one performance, challenging the disembodiment of our digital lives. Immersed in a separate and intimate space, a performer leads individuals through having their 'movement portrait' taken. Outside, viewers can watch as a 3D imaging system renders movements into a visual portrait through a process akin to a calligraphy of the whole body. 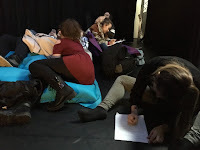 As our students are working across Film, TV and Stage and are currently devising their own intermedial performance works, this was a great opportunity to introduce them to new and exciting ways of combining technology with performance, whilst also giving them insight into interactivity and immersive environments. Jan and Tim created such a cosy and relaxed atmosphere n DS2, students remained in the visitors area for the whole duration of the installation, ceiling out on bean bags whilst watching each other's 'portrait' being taken. The two artists also gave a talk about their works, shedding light on the the many and varied collaborative processes they have experienced as artists, individually and together. This rang a bell particularly in the ears of those first year students who just collaborated with animation students on some Motion Capture experiments, and understand the excitement but also the possible difficulties and compromises that collaborations can entail. Jan Lee is a performance artist working at the intersection of dance, music and theatre. She has collaborated with a wide range of artists who work in sound design, dance theatre, neuroscience, digital interactive technology, poets, actors and musicians. 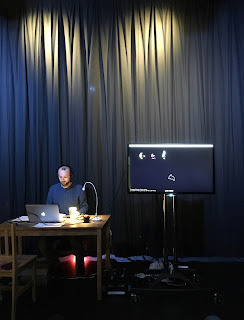 Tim Murray-Browne is an artist working with code and interactive technology. His work includes interactive installations of bespoke musical instruments, immersive audiovisual dance performances and sonic sculptures that reveal themselves as the listener moves through space. 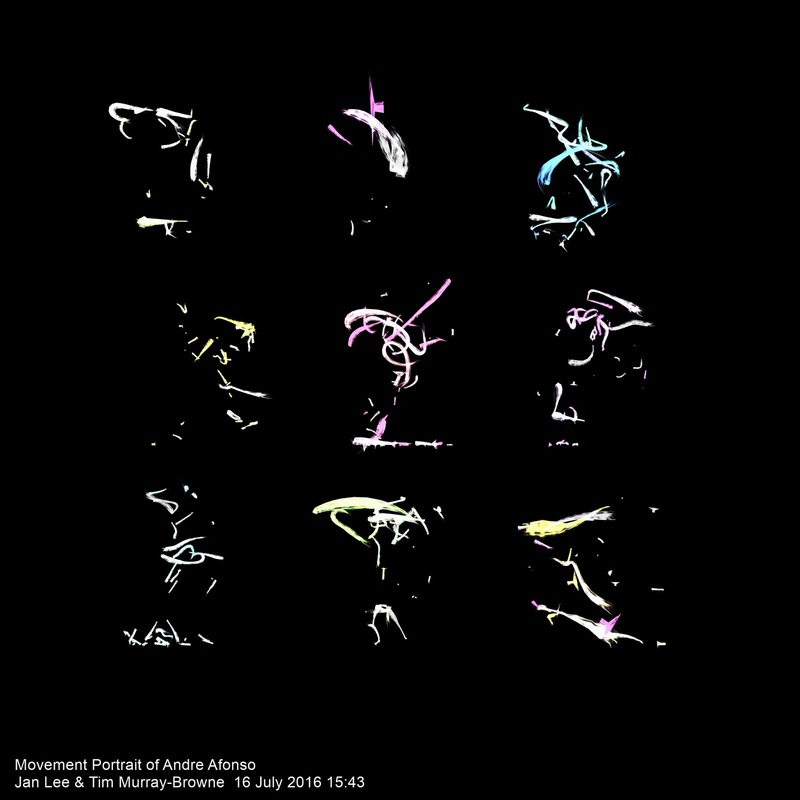 They created Movement Alphabet in response to a sense of disembodiment in our digital lives. How can we express our identities online beyond selfies and status updates? The experience Jan and Tim offer is an invitation to consider the personality of the moving body, the lifetime of experiences, choices and habits entwined into our every physical gestures. 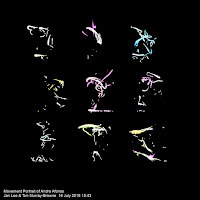 Movement Alphabet has previously been shown at the Victoria &Albert Museum, Watermans Arts Centre, G.A.S. Station and Tate Modern, all in London. And now at Bucks New University in High Wycombe . . . Thank you very much, Jan and Tim for joining us!